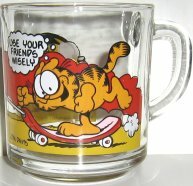 Garfield is riding on a skateboard being pulled by Odie. As Garfield says: "Use your friends wisely". This clear glass mug is copyright 1978 and is in very good condition - no fading.